African Environments takes safety very seriously, particularly when it comes to leading walking safaris in the Tanzanian wilderness. All of our Serengeti waking expeditions are accompanied by a trained and armed leader as well as the park regulation ranger who is also armed. Carrying a weapon in the Serengeti is necessary, although rarely fired the sound of the cocking gun can be used as a deterrent for any wildlife that could be a threat. More importantly, our expedition leaders are fluent in the language of the bush; looking for tracks, knowing where certain animals like to rest or hide and more so knowing the distance in which to stalk wildlife is just as effective in leading a safe yet adventurous walking safari. 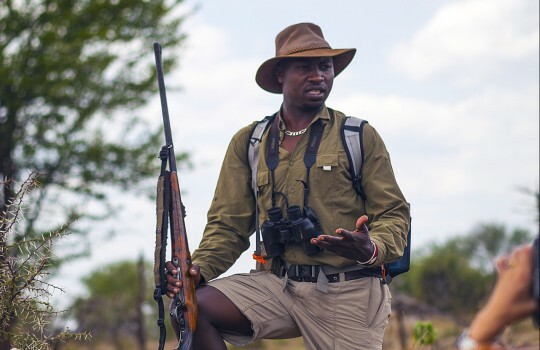 Twice yearly African Environment provides training for the Trip Leaders and Guides who carry weapons in the bush; this training maintains and sharpens skills. A certainly level of fitness and health is required therefore when planning your Tanzanian walking safari you should consult your personal GP/Doctor or specifically a travel doctor who will be able to advise on any medications or inoculations you may require. Depending on age, travel history and medical situation the recommendations may differ. Walking safari dress is casual and your wardrobe does not require any “special purchase” items apart from good quality pair of walking shoes and perhaps gaitors if you are used to wearing these. The emphasis should be on cool, comfortable and coverage if you are sensitive to the sun. In a few areas like Ngorongoro highlands, it can get quite chilly at night so be sure to bring warmer layers. It is preferred that your daytime clothing be in neutral colors to blend in with the surroundings. Additionally in tsetse fly areas blue and blue clothing is not recommended as the insects are attracted to this. Plenty of changes of underwear and some warm socks for evening. Snacks: trail mix, nuts, hard candies, decaf beverages, powdered electrolyte replacement drink mixes such as Gatorade if you feel the need for these things however African Environments does cater to all dietary requirements and snacks are provided. On a walking safari with African Environments you can expect to walk anywhere between 5 to 15 kilometres (3 – 10 miles) per day. The Guide and the crew can be extremely flexible, depending on the requirements of your group but you should have a reasonable level of fitness. The area in which we walk is remote; you will experience a true sense of being alone with the wilderness. You should expect that the days are quite hot; we recommend you bring drinking bottles or camel backs, a good wide brimmed sunhat and sunscreen. Larger animals will steer clear of humans, they may wander through camp only when all is quiet and when all are asleep but they will not come close to tents. Small animals however, like mosquitoes and tsetse fly will be a huge annoyance without some good quality repellent. You should expect to see all sorts of wildlife, from bugs to spiders as well as hopefully lions and leopards! When in the towns, Tanzania is a relatively peaceful yet still developing African county with a vast and wild wilderness. The countries natural attractions; the mountains, animals, rare cultures, beautiful beaches and exotic locations have helped develop a healthy tourism industry which thankfully allows millions of people directly and in-directly to earn a good living. However, poverty can still be seen while visiting Tanzania and it is advised to act as respectful as possible. Please talk to your Guide about taking photographs, customs and actions that may offend while in-country. Tanzanian people by nature are extremely friendly and warm but bear in mind that crime does exist like in all cities around the world. Your Guide will brief you fully on arrival regarding personal safety. Please do not hesitate to ask as many questions as you need.